Stella Louella cannot seem to find her library book that is due at 5:00 All day, she tracks down its whereabouts along with others in the community who have seen the book along its trip. Find out where the book ends up. 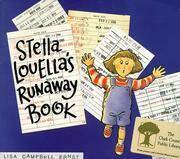 Ernst, Lisa Campbell, “Stella louella's runaway book,” Children's Picture Book Database at Miami University, accessed April 23, 2019, https://dlp.lib.miamioh.edu/picturebook/items/show/8002.